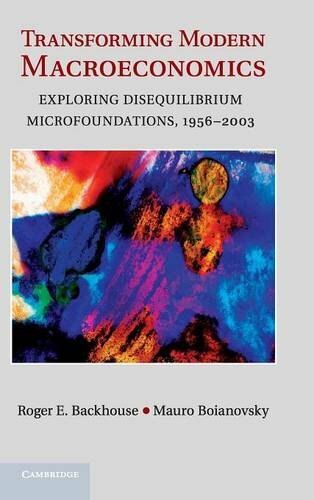 This book tells the story of the search for disequilibrium micro-foundations for macroeconomic theory, from the disequilibrium theories of Patinkin, Clower and Leijonhufvud to recent dynamic stochastic general equilibrium models with imperfect competition. Placing this search against the background of wider developments in macroeconomics, the authors contend that this was never a single research program, but involved economists with very different aims who developed the basic ideas about quantity constraints, spillover effects and coordination failures in different ways. The authors contrast this with the equilibrium, market-clearing approach of Phelps and Lucas, arguing that equilibrium theories simply assumed away the problems that had motivated the disequilibrium literature. Although market-clearing models came to dominate macroeconomics, disequilibrium theories never went away and continue to exert an important influence on the subject. Although this book focuses on one strand in modern macroeconomics, it is crucial to understanding the origins of modern macroeconomic theory. Since the 1950s, macroeconomics has been transformed. This book is about one of the most important aspects of that transformation: the attempt, through the end of the twenty-first century and beyond, to construct macroeconomic models rigorously derived from models of individual firms and households.